Siri, Alexa, Google Home, are you listening? Both mobile and smart speakers are normalising voice search technology and features in the high tech world we live in. By 2020, a total of 50% of web searches will be made through voice. 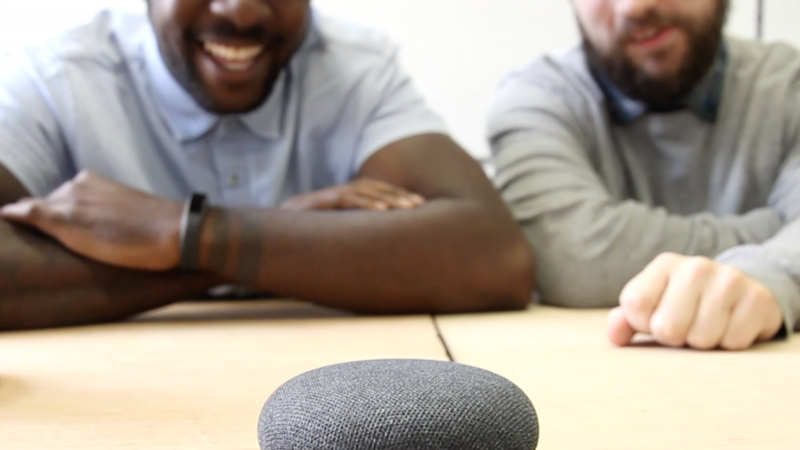 The current obsession with digital assistants to find out the weather forecast and tell a funny joke has led voice search to become more than just the next big thing, it’s a digital trend that’s only going to get better and more impactful. A current 20% of Google searches are made by voice. From asking what is the time in Japan to finding a pizza takeaway nearby, digital assistants use a combination of artificial intelligence and speech recognition to give you a logical answer to your proudly spoken questions or commands. Google even provided a form of voice search back in 2002, when users could dial a phone number, ask their question and receive their google search results by text. This was just the early days of the digital, interactive voice search we have today. So why has voice search become so popular in modern technology? Searching with voice is 3.7 times faster than typing. It’s quick and easy to do, so why waste time typing your search into google when you can ask the search engine yourself? In the 21st century, we are always on the hunt for innovative, more efficient, hassle-free ways of doing things, and voice search is exactly that. Voice search can be popular amongst users that are driving as it removes typing completely, enabling them to ask for directions or even where the nearest petrol station is located. We are part of a generation that’s conditioned to digital living. A google search can answer any question almost instantly, a voice search can do it even quicker. The way we search the web by voice has evolved from regular web searches. We don’t have time to think about the wording of the search, we talk like people and ask questions. Voice search is often used for quick interactions like searching for a nearby location, the weather forecast or an update on travel times. The way we search by voice is usually a question, a regular web search is most often a statement. Voice searching is more personalised and conversational for the user and long tail keywords should be used to target overall topics rather than specific terms. The way the user experiences digital assistants and voice search allows them to access information almost instantly without having to scroll through multiple pages to find their answer. Your website content should be written in a natural tone of voice that answers your customers’ questions, making it easier to find via voice search. Digital assistants also rely on the top ranking searches which puts pressure on optimizing your websites SEO. Sorry, I didn’t understand that. The question we’re all asking, “why does my digital assistant not understand what I’m saying?”. Smart speakers adapt to the way we talk and gradually improves the recognition of the tone, accent and pronunciation of your voice. They get smarter based on how you interact with them and are able to learn about the context and preferences of your searches. This helps your digital assistant understand what you are searching for in the long run. So give Alexa a chance, she’s just getting to know you! Is Alexa listening too carefully? It’s no secret that your recent google searches will appear as an online ad, but does your digital assistant act more like a fly on the wall of your home? Alexa is known to randomly wake up if it hears a buzzword. This has made many people wonder if they are constantly listening to our conversations. Have you ever spoke about a product or service while Alexa has been lurking in the corner, and an ad’s appeared on your Facebook feed shortly after? Many believe companies including Google, Amazon and Apple are using their digital assistants to collect data about their customers’ lifestyles and interests. So next time you’re telling a secret, make sure Alexa’s out of sight! No one can predict the future, but we all know voice is the future of search. With digital assistants in our homes and quite literally at our fingertips, the experience is already easily accessible to users and will only continue to get better with 30% of searches to be made without a screen by 2020. From asking your iPhone 4 how much wood could a woodchuck chuck, to making Alexa set an alarm for the following morning, voice search has evolved considerably over the recent years and it’s only going to get bigger and better, with some users already making purchases over voice command. So, Google, are you still listening?